Subscription based business models require real time customer support. 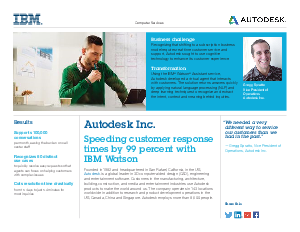 Autodesk turned to IBM to enhance their customers' experience. Using Watson Assistant, Autodesk developed a virtual agent to interact with customers, applying natural language processing (NLP) and deep learning techniques to recognize and extract the intent, context and meaning behind inquiries. Quickly resolving easy customer concerns, Watson Assistant is supporting 100,000 conversations per month, with response times 99% faster than before and leading to a 10-point increase in customer satisfaction levels for Autodesk. Find out how Watson Assistant can accelerate your customer support experience.